Ewww. And they have mold issues too. Had to click... and just, seriously, what the h-e-double-hockey-sticks is wrong with these people? They should be roundly slapped: the people who apparently can't flush and/or clean a toilet, whoever removed the lid (ew), whoever took the photo, whoever posted the photo in the listing- all of them need a good swat (or several) upside the brainpan. I'm afraid the mold in the last picture is mad skeery. Gave me an asthma attack just looking at it. Well, at least the toilet is located in a predicable spot. Please tell me the shed in the backyard is not the "non-conforming in-law." Maybe it's non conforming because the toilet is located just outside the front door? I've seen that house. It's a charmer. The good news is that in that neighborhood there's a good chance the appliances and toilets have been stolen by now. Or tagged. well, at least the listing says it's a "fixer-upper". but STILL. When we tried to sell my grandparents house after it had been sitting empty for almost a year, we had to go to the house and clean it out. One afternoon I had to use the facilities, and when I flushed the toilet it started making these disgusting farting and thumping noises and all this thick brown sludge started pouring into the bowl instead of water. It was like something out of the Amityville Horror. Turns out that leaving a house for a year in the PNW without turning off the water is a baaad idea. So it is POSSIBLE that it's just sediment (i hope i hope i hope). But WHY oh WHY would you put that photo in the ad? Wow. Was the architectural design essentially 'a scaled up pre-fab shed'? Also, I don't trust the look of their cooker - his eyes are too far apart. Yeah, the tird picture they have there is quite nasty! Even the swan is disgusted, lol. Wait a minute, let me get this straight... The detached living is a shed? Two bedrooms On bathroom In the front house. In the Non Conforming in law One bedroom one bathroom and kitchen. Ot Size 5,100. Say what?! Is the shack for the in-laws? Or does it not conform to the law? And is the against-the-law in-law shack part of the 812 square feet listed? I was gonna suggest that it might be well water, which can have a reddish brown tint to it. . . but google maps clearly proves me wrong. Well, at least there is an orange cone out front to warn potential buyers of, well, the whole thing. 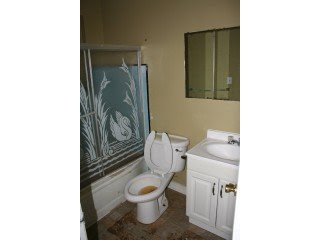 Though I have only discovered this lovely site a few months ago, I have seem to notice a link between horrible toilets and the need to have swan patterned shower curtains near them. Trend? OMG That is so scarry! And people wonderwhy they get no showings!